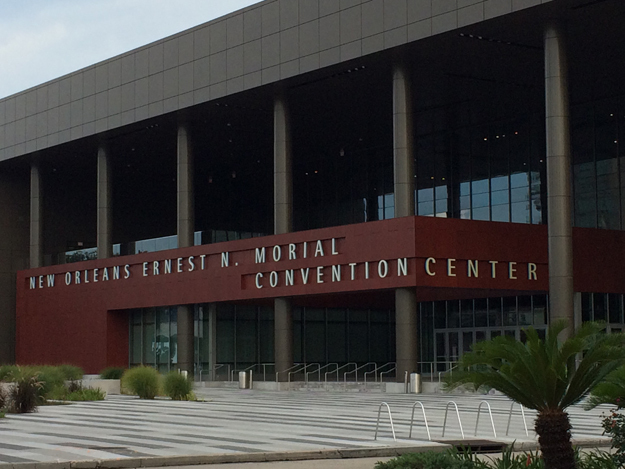 The Great Hall of the New Orleans Ernest N. Morial Convention Center was a bustle of activity the day before 18,000 cardiologists from all over the world were set to arrive for their annual gathering. Electricians tinkered with video screens fixed to elaborate display booths, one of which had two floors with a stairwell leading to a terrace. Designers paced across a large mauve carpet that had been laid just days prior. It took five days this week to construct dozens of booths advertising medications and heart-saving devices. The event itself will last half that long. The convention center is at the heart of a debate over how much tax money it and other visitor-focused groups should receive, and how much should instead pay for the city’s critical infrastructure such as road maintenance and the Sewerage & Water Board. In recent months, Mayor LaToya Cantrell has made carving out a larger share of hotel tax revenues for city infrastructure a top policy priority. As part of that push, the mayor has said she wants a one-time immediate payment of $75 million to come straight from the convention center’s reserve account, which has swelled to more than $230 million on the back of state-authorized and voter-approved taxes on local hotels. Sawaya, speaking with NOLA.com | The Times-Picayune this week, said handing over that kind of money right now would be a tough pill to swallow. That, he said, is because the convention center is embarking on a $557 million improvement plan aimed at renovating several key facets of the building, which stretches almost a mile along the Mississippi River. Part of that package includes $67 million to help spur construction of a new 1,200-room hotel, pegged for 47 acres at the convention center’s northern end across from Mardi Gras World. The hotel proposal has come under scrutiny from Cantrell and the watchdog nonprofit Bureau of Governmental Research, which priced the incentives developers are seeking at nearly $330 in public costs including tax breaks and a free land lease. A consultant the convention center hired has said those incentives round out closer to $170 million. “… There is a call to waive sales and occupancy taxes worth hundreds of millions of dollars over the life of the hotel. That’s money our citizens cannot afford to do without,” Cantrell said in an August letter opposing the hotel proposal. Another big-ticket item is $175 million to redesign and upgrade spaces in and around the convention center’s 143 meeting rooms. That work would include installing digital monitors, replacing lighting and sound equipment, and integrating hallways that are frequently used for meeting space, according to the convention center’s vice president of sales and marketing, Tim Hemphill. Also in the plan is about $40 million to replace the convention center’s roof; $15 million to gut the restrooms; $10 million to replace and repair elevators and escalators; $21 million for digital signs and other technology upgrades; and $20 million to create a spruced-up with a new transit hub for shuttles and ride-share vehicles under the Pontchartrain Expressway overpass. Construction aimed at reducing Convention Center Boulevard from four to two travel lanes and a $79 million pedestrian park is also underway, all expected to wrap up in August 2020. Sawaya said having those renovations in place within the next five years is key to keeping New Orleans’ convention center competitive with other similarly purposed facilities across the country. He pointed to six other cities including Atlanta, San Francisco and Las Vegas that are poised for extensive additions and renovations to their convention centers. The cornerstone of keeping New Orleans’ convention center nationally competitive, Sawaya said, is the new hotel. Amid criticism of the project, Sawaya argued the hotel would draw more convention attendees to New Orleans who spend money at nearby businesses while they’re here. Sawaya pointed to analysis from the convention center’s consultant, HVS Convention, Sports and Entertainment Facilities Consulting, that he said figured conventioneers spend 25 percent more in the city than other visitors. It also estimated the hotel would drum up $18 million in annual sales tax revenue for the city, he said. “You have to have that hotel to fully maximize the occupancy of your visiting halls,” Sawaya said. The hotel’s design and financing package have not been approved yet by the convention center’s governing board. Sawaya said it could come after the Louisiana Legislature meets this spring. That’s when legislation will likely be proposed to tweak language in current state law that restricts how the convention center can spend its hotel tax revenue, he said. That legislation, Sawaya said, would scrap a provision that requires a chunk of tax revenues to fund an expansion project that the convention center decided to abandon after Hurricane Katrina. It’s been a focal point for critics of the convention center’s large reserve account who question why that account has been allowed to grow so large for a project that won’t ever be built. “We have to unwind that,” Sawaya said, referring to state law on the expansion project-tied tax revenue. Outside the hotel, Sawaya said the convention center would likely seek to issue more than $300 million in bonds to fund renovations to its existing building. Those bonds would be financed by revenues from several taxes, including levies on hotel and food and beverage sales. Those taxes brought in about $62 million for the convention center in 2017, according to the most recent state audit. Aside from financing bonds, Sawaya said those taxes are essential to covering the convention center’s operational expenses. Fees charged to groups that book halls and meeting rooms and other on-site sales only cover about half of the convention center’s roughly $66 million expenses, the 2017 audit shows. Hemphill said that model is nationally practiced and aims at creating windfalls for surrounding businesses and governments through sales taxes. Meanwhile, Cantrell has pressed since fall for revising how the state dedicates hotel-tax revenues as a way to lock in more money for city street and drainage improvements. Officials in her administration have estimated the city needs between $80 million and $100 million in new annual money to meet infrastructure demands. Last month, Cantrell told NOLA.com | The Times-Picayune that she wants $20 million of that to come from hotel-tax revenues that otherwise go to the convention center. Sawaya said this week that the mayor’s tax rededication plan, which would require state legislative action, is not on the table for the convention center. Also unlikely is the $75 million lump-sum payment Cantrell seeks, he added. But providing money for infrastructure and Sewerage & Water Board purposes is not out of the question for the convention center, Sawaya stressed, so long as there is a definite proposal. He noted the convention center has signed agreements with the city in recent years to give funding for public safety and roadwork. Doing so again for specific drainage or other infrastructure initiatives, and paired with detailed cost estimates, would be within the realm of possibility, Sawaya said. Correction: The American College of Cardiology’s 68th Annual Scientific Session and Expo is expected to have 18,000 attendees, not “nearly 2,000” as was originally stated in the story.